Have you been Romanced Scammed? DO YOU WONDER IF YOU ARE LIVING YOUR BEST LIFE? Are you looking for a better way to live? With a group of like-minded trailblazers? 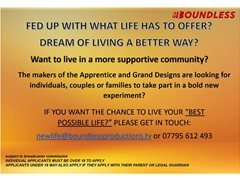 The makers of The Apprentice and Grand Designs are looking for individuals, couples or families to take part in a bold new experiment.